Back in July 2015, the claimant underwent routine root canal treatment to her UR5. Following the RCT, the Defendant placed a post ready for a crown into the tooth. Unbeknown to the Claimant, the Defendant had inserted the post at the wrong angle and perforated the mesial wall of the root of UR5 with the crown post. The Defendant failed to spot that the post had perforated the root of the tooth and the Claimant suffered with multiple infections as a consequence. It was only when the Claimant attended another dental practice in September 2017 that radiographs were taken which revealed the post perforation. A letter of claim was drafted and sent to the Defendant who forwarded the letter to his defence organisation to be dealt with. 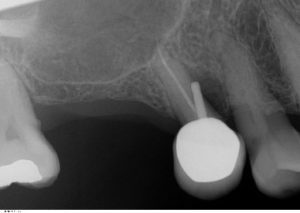 The Claimant was advised by her new dentist that that her options for treatment to her UR5 were limited due to the high risk of fracture and infection from the incorrectly positioned crown post. The Claimant in relation to causation argued that on the balance of probabilities, following RCT to UR5 had the Defendant inserted the post crown at the correct angle, then this would not have perforated the mesial wall of the UR5 and the problems including pain and suffering from recurrent infections that the claimant was suffering would have been avoided and the tooth would not have to be extracted. A letter of response was received from the Defence Organisation instructed which included a settlement offer out of Court. After some negotiations with the Defence Organisation, the Claimant finally accepted the sum of £4250 in settlement of her claim.